A heavy duty metal frame and powerful motor make this machine a true workhorse. Free Owner's Class videos and lessons via Singer App. The Heavy Duty 4452 sewing machine is designed with your heavy duty projects in mind, from denim to canvas. Thanks to the machine’s powerful motor, you have extra high sewing speed to save you time. With adjustable presser foot pressure, you can also sew very lightweight sheers, and the stainless steel bedplate allows fabrics to glide over the machine with ease. Create original costumes, sew personalized fashions or transform your home with new decorator pillows and curtains. Among the 32 stitches is a one-step buttonhole, giving you consistent results every time for projects you’ll be proud to say you made yourself. The Top Drop-in Bobbin is not only easy to thread, it’s easy to see so you won’t run out of bobbin thread in the middle of a seam. Thanks to the SINGER Sewing Assistant App, help is available anytime you are, to help you learn how to set up to sew various fabrics and techniques. 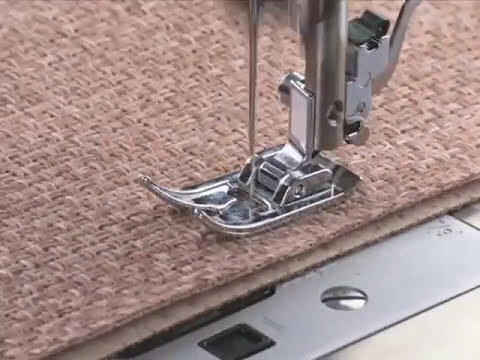 Instructional Video (+)Learn your machine's basics like threading the machine correctly, selecting stitches, making a buttonhole, changing the needle and more. Available online whenever your are! SINGER Sewing Assistant App (+)Use this App to help you learn about the parts of the machine, how to set up the machine to start sewing including threading the top of the machine and the bobbin, how to select stitches for various techinques, and more. One-Step Buttonhole (+)Buttonholes are sewn in one easy step. Just place the button in the buttonhole foot and the machine sews a buttonhole perfectly sized for that button, delivering consistent results every time. Easy Stitch Selection Dial (+)Built-in stitches are displayed on the Stitch Selector Dial. Simply turn the dial to select the stitch you want to sew. Adjustable Stitch Length (+)Customize the appearance of a stitch by increasing or decreasing the distance between stitches. Use this function for various stitch techniques like applique, basting and more. Adjustable Stitch Width (6mm)The size of the stitch from left to right is adjustable, to make the stitch sew narrower or wider as desired. Adjustable Presser Foot Pressure (+)When sewing very lightweight or heavyweight fabrics, it may at times be necessary to decrease or increase the presser foot pressure to help the machine feed the fabric through the machine. Reverse (Lever)Sew stitches in reverse, usually done to secure a seam at the beginning and end to prevent unraveling. Stainless Steel Bed Plate (+)The surface of the machine's arm is made of stainless steel, providing a smooth surface that allows your fabrics to glide smoothly as you sew. High-Performance Motor (+)The machine has a motor that is 60% stronger than a standard sewing machine motor, allowing you to sew at higher speeds up to 1100 stitches per minute. High Speed Stitching (1100/min)Professional speed for faster results. Single Class 15 Bobbin. Make sure to check for compatibility with your machine!